This post covers what happened in Decred in the month of November. It is the 8th issue of the Decred Journal and you can find the original post on GitHub. Past issues are available via this GitHub link. dcrd: Two big changes started last month were merged after extensive testing. First one is reversed UTXO set semantics and its accompanying database migration, an important change that provides simpler and more efficient handling of unspent outputs. A side effect of this is that full block reorganization tests run 40% faster. Second one is optimized reorganization handling. New –maxsameip argument allows to limit the number of connections with the same IP address. A fix to an ultra rare bug was ported from upstream btcd. Work started on a big change to improve the calculation of “locked” balance that should address some issues for solo, VSP and split ticket voters. Politeia: politeiavoter privacy and performance was improved by randomized ticket voting order, randomized delays between votes and filtering of already voted tickets. By popular demand an email notification system was created to support awareness about new proposals and comments. Verification of cast votes was made possible by the search by ticket feature where the search is performed on the client side to protect privacy. Comment permalinks and distinguished author comments are now live. A new “Abandoned” status was added to handle abandoned proposals. “Finished” tab was split into “Approved” and “Rejected” tabs. SVG support was disabled until proper tooling to sanitize SVG is found. A small vulnerability was patched, thanks to @iemlisted for reporting. Lots of smaller improvements and bugfixes. Several privacy issues were discovered and discussed. A patch is being tested to replace Google recaptcha with self-hosted CAPTCHA to avoid fingerprinting of stakeholders — VSP operators are welcome to join testing. Request to Cloudflare was removed. An issue to make email optional was raised. design: @kyle at Firethought announced a Decred icon motion pack which promises to bring “more engaging Decred application experiences” and builds on the icon pack designed by EETER. docs: November was a huge month for documentation with a variety of community supported changes and updates. The proposal passed which confirmed a community desire to change “PoS Mining” to “PoS Voting” and “stakepool” to “Voting Service Provider (VSP)” in all Decred documentation. First batch of changes is merged. Updates were made to adopt the term “Decred Treasury”. For those looking to take a deeper dive into Politeia a new Navigating Politeia Data page was created. The long awaited Decred Glossary was completed and published in part due to a huge effort by @s_ben and many people who supported the work with feedback and suggestions. We highly recommend utilizing the glossary to improve our shared community understanding. Congratulations to 5 new contributors listed on decred.org: Insaf Nori (@butterfly, community manager — Middle East), Guang (@guang, community manager — Asia), Seth Benton (@s_ben, developer), Youssef Boukenken (@sef, developer), Zubair Zia (@zubairzia0, research and strategy). Nick Kaeshko (@Nick) — co-founder, making sure things run smoothly. Maria Pleshkova (@Maria) — UI/UX designer, contributed to the stakepool theme overhaul, making it more consistent with the current UI of Decrediton. Currently working on the redesign of Politeia: some UI/UX updates and new features implementation. Dmitry Fedorov (@klka) — Golang developer, currently in the process of making blockchain indexes asynchronous to speed up block processing. The author proposes to change Decred’s mining algorithm to ProgPoW. This is a proposal to get Decred advertised on a radio show called “Free Talk Live”. Total cost is $22,750 for 13 weeks. The proposal aims to fund the work of adding Decred support to “Coffee Wallet”. This would cost 150 DCR and is projected to be ready by early January. Hashrate: November’s hashrate opened at around 156 PH/s and closed around 159 PH/s, reaching the low of 125 PH/s and high of 234 PH/s in between. BeePool’s share varied between 19–30%, F2Pool 15–46%, Luxor 1.6–4%, and Coinmine 1.9–4%. Unknown hashrate stayed between 25–50% with lows of 15% and spikes to 75%. Pool distribution numbers are approximate and cannot be accurately determined. Staking: 30-day average ticket price was 103 DCR (+3.2). The price varied between 96.7 and 110.2 DCR. Locked amount was 4.02–4.18 million DCR, which corresponded to 45.9–47.2% of the available supply. Obelisk began producing Batch 2–5 units and expects to begin shipping in early December, after that it will take ~4 weeks to fulfill all orders. On Dec 4 they announced several new offers: SC1 hashing boards can be purchased and installed into DCR1 units, DCR1 can be converted to Batch 6 SC1 or sold back to Obelisk. The details are in the newsletter post. The Whatsminer D1 turned out to be 48 TH/s, 9% up from expected 44 TH/s. The price was bumped by $350 to $4,850 from Pangolin. MicroBT’s price changes and shipment delay were handled differently by resellers and drew varied opinions from the community about best practices. Luxor pool announced a 3–5% hashrate boost for Decred miners. @Dustorf released an extensive blog detailing the process of Ditto’s proposal approval from preliminary vetting, to proposal discussion and voting, to the next steps in planning and executing. The blog received a ton of pre-release feedback in #marketing showing the power and skill of our writers. Much work was done aggregating data to upload and share with the Ditto team so we can hit the ground running in December. @Dustorf had an onboarding call on Monday, Dec 3, and he and @jy-p plan to meet with Ditto in person later that week. Per @Dustorf’s blog, the initial focus will be on gaining community alignment on positioning and messaging, then rolling that into some web updates while also planning for 2019 execution of the communications strategy. Ditto will engage publicly on Matrix in #marketing, and sensitive information will be reserved for a new Matrix room called “Ditto PR”. If you think you can help and would like to be invited to this room, please reach out to @jz or @Dustorf to be added. December will be a month of planning, and @jy-p will present “Applications of Blockchain Timestamping” at The North American Bitcoin Conference in Miami, USA on Jan 16–18. Other events will likely be confirmed the first week of December and will be made public in #marketing. The North American Bitcoin Conference in Miami, USA on Jan 16–18. @jy-p will give a 15 minute presentation on the main stage on Politeia. He’ll also explore a wide variety of applications that could utilize Politeia, including cryptocurrency, corporate, and governmental. Examples include tokens, record keeping and voting systems. Decred will also have a 10’x8’ exhibit booth, so we’ll need to put a team together. We’re looking for community members to join us to work the show. Please message @Dustorf if you’re interested. 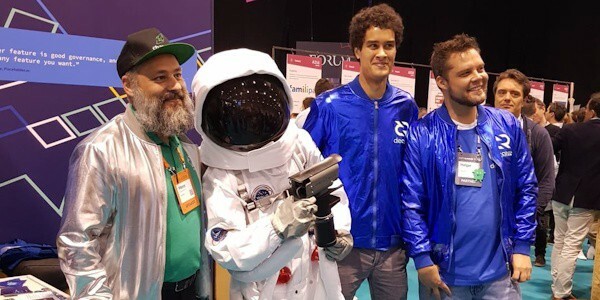 Campus Party in Sao Paulo, Brazil on Feb 12–17. Decred will have speakers and an exclusive area for hackathons. Jalisco Talent Land in Guadalajara, Mexico on Apr 22–26. Decred will have a 3x3 m booth with 10 conference passes. @elian will present an overview of Decred (45 min) with Q&A (15 min), plus there will be a two hour breakout session where we’ll walk through How to Use Decrediton, Staking Process, Lifescycle of a Ticket, and How to Use Politeia. Contact @elian if you’re interested in helping/attending. 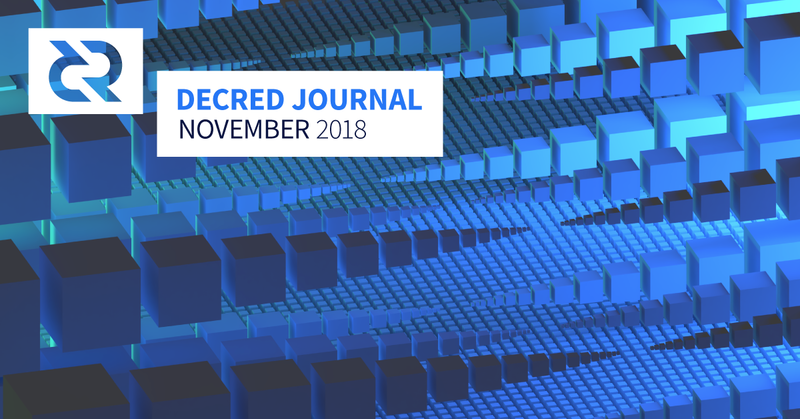 Decred Journal — October 2018 in Russian and in Italian by @DZ. This is epic work, October issue was 53 kilobytes of text, 1.5x larger than previous record. Several videos were added to Decred’s Texas Bitcoin Conference playlist which now has 18 videos. All 52 videos from the event are in this playlist. Two new rules added to r/decred: “One Price Thread at a Time” and “No Enticing”. Motivation explained in this post. The crypto market saw a $70 billion drop in November with most of the top 100 assets by marketcap losing 30% to 60% of USD value. Bitcoin established an aggregated low at $3,606 after dropping from its monthly high of $6,540 making a total 45% peak-bottom spread. Between Nov 14–15 most top 100 assets lost 10–20% USD value in a single day — one day before the infamous BCH split. Forbes and Bloomberg attributed the BTC dump to the Bitcoin Cash fork, the latter citing fear, uncertainty and doubt of some guys. At the end of the month both coins emerged from the fork as sustained new chains but together the price is 40% less than pre-fork lows. Others like Yahoo Finance attribute the SEC rulings about ICOs to the drop. Nvidia reported a drop in GPU sales for mining. This must have nothing to do with Ethereum, Zcash and others receiving ASICs for their GPU-oriented mining algorithms, but rather “it is really the canary in the coal mine for Bitcoin and other cryptocurrencies” per the experts. Seriously guys, it is the collapse of cryptocurrency mining. Zcash is looking into hybrid ASIC-GPU mining, among other improvements planned for next year’s protocol upgrade. A new core library written in Rust was released for Bitcoin Cash. This adds to existing rust-bitcoin, parity-bitcoin and bitcrust. Rust is another modern language besides Go that aims for safety and performance. It’s nice to see this software emerging since it may be useful for Decred, which is open to multiple implementations. Bitcoin Cash, born as a solution to the long-running Bitcoin scaling debate, itself had a contentious hard fork this month. This article has a good summary of what the fork was about. The sides came to be referred to by their dominant software implementation, Bitcoin ABC and Bitcoin Satoshi’s Vision. BCH ABC was planning a hard fork to add canonical transaction ordering and a new OP code — BCH SV rejects these changes and plans instead to return to a set of rules based on Bitcoin version 0.1.0. Miners and oracles seemed to be split relatively evenly between the two sides, with Roger Ver and Jihan Wu on the ABC side and Craig S Wright and Calvin Ayre on the BCH SV side. This contentious hard fork was even more contentious than most, as the BCH SV side announced that they would nullify the replay protection added by ABC (another good article about the run-up to the fork). SV actually planned to mitigate ABC’s replay protection by allowing miners to collect any BCH transferred using the new ABC OP codes — so that the use of these new features would result in the loss of BCH on the SV chain. There were also threats to attack the ABC chain and kill it, or make it unusable for long periods, should the SV chain have sufficient hashpower. Looking at all the fighting in other communities I (@bee) can’t help but insert a personal comment. It appears to me that communities waste a ton of energy on all the controversies. This energy is not building value. Chain splits and community splits leave both sides with less people, less talent, and less chances to make any long term impact. It is ironic that in a space of programmed decentralized consensus systems so many people fail to achieve human consensus. Decred manages to keep moving at its decent speed because it avoids external, and more importantly, internal conflicts. Let us keep incentives aligned and keep the community together. Aragon released a new version on Oct 30 which allows users to create organizations on the Ethereum mainnet. Prior to this, 15,000+ organizations had apparently been created through previous versions on Ethereum testnets. Aragon can be used to create an “organization”, add members and assign them tokens, and then hold signal votes with those tokens. The community also recently voted overwhelmingly (99.97%!) to approve AGP-1, a Governance Proposal Process. The NavCoin community fund was launched on Nov 16. NavCoin’s community fund operates on “dual-vote consensus”, with an initial vote to decide if a proposal is approved or not, and then a subsequent vote to determine whether the payout should be made (after the work is done). Voters are participants in NavCoin staking, and vote with the weight of their stake. The community fund receives 0.25 NAV from each block minted, 500K NAV per year, or around $93K at today’s prices. Proposal voting lasts for one week and requires participation of 50% of stakers, with 70% approval required for acceptance. UK government canceled a stablecoin project based on a fork of btcd. @alexbosworth noted: “The thing about stablecoins is that one day someone can come along and cancel the whole thing.”. Unchained podcast episode discusses “why ICOs are down 90% since the winter, why airdrops could be a better than ICOs for seeding usage on networks, whether or not they’re legal and which wallets to target.” (non-itunes link). SMS, and relying on mobile operators in general, shown to be a bad choice for 2FA. In this recent incident, a server not even protected with a password leaked millions of SMS messages containing 2FA codes, password resets and other sensitive information nearly in real-time. In another case, lawsuits like this will hopefully push cellular providers to improve security, but they won’t get your coins back. Speaking even more generally, most smartphones have a baseband chip and other proprietary parts — nobody really knows what they are doing or how vulnerable they are. Digital currencies & blockchain governance. Curated writings from Decred contributors across the blockchain ecosystem.